Inspect all of your packages carefully upon receipt. We must be informed of all damages within one week of you receiving the product. If there is damage, retain all shipping materials (including all outer and inner packaging boxes). Please re-pack the damaged product in the shipping box with the original packing material as we may put in a UPS claim for the damages. If a product is damaged we retain the right to put in a damage claim with UPS. UPS retains the right to inspect any damaged merchandise, and they require that the customer retains the all shipping boxes. In many cases UPS will not pay a claim unless the outer shipping box is damaged--and if you throw away this important evidence we can not put in a claim with UPS and we can not replace your damaged product. Orders under $400 will be charged standard FedEx rates. Orders over $400.00, with only free freight items, shipped to commercial addresses will be shipped free. Items that are NOT free freight are have "FREE FREIGHT OVER $2,000" at the end of their title. If shipped to a residential address there is a charge of $4.95. If your order also has non-free freight items, place a separate order for those items. Orders over $2,000 will be shipped free of charge!! This includes all items we sell. However, if you need a lift gate or small truck for a residential delivery, there will be extra charges. Please contact us for this pricing. Potentially, we can ship anywhere in the world. That said, for orders outside of the United States we usually limit ourselves to larger orders that are shipped by the pallet and paid for with wire transfers. Has my order shipped and when will it arrive? Orders are usually shipped in one to two business days (business days are Monday through Friday, non-holidays). Orders placed before noon Tuesday through Friday will usually be shipped the same day, and orders placed after noon on Tuesday through Friday will usually be shipped the following business day. Monday orders will either be shipped on Monday or Tuesday. Weekend orders are usually shipped on Monday. In general, we do our best to ship as quickly as possible. Almost all products are shipped from Tempe, AZ, and Ground orders shipped from Tempe will take anywhere from 1 to 5 business days to arrive. FedEx Priority Overnight takes one business day. Packages will be delivered by 10:30 AM, but there are some remote areas where the package will not be delivered until 5:00 PM. FedEx Standard Overnight takes one business day. Packages will be delivered to most areas by 3:00 PM, but there are some rural areas where it will not be delivered until 5:00 PM. FedEx 2Day takes two business days. Packages will be delivered to business by 4:30 PM and to residences by 7:00 PM. FedEx Express Saver takes three business day, and will be delivered to a business by 4:30 PM and a residence by 7:00 PM. Please keep in mind that business days are Monday through Friday, non-holidays. For example: An order placed on Wednesday after noon using FedEx Express Saver will not arrive until the following Tuesday (or later if any of the weekdays are holidays). Although FedEx does have a Saturday delivery service and Saturday pickup, for various reasons we do not use these services. The above listed days do not count as business days. UPS will not pick up or deliver packages on these days (except for UPS Express Critical, which we do not ship), with the exception of the day after Thanksgiving and New Year's Eve when UPS will deliver and pickup expedited shipments. 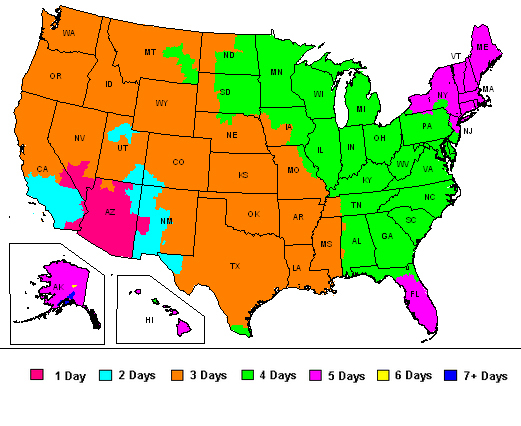 For all the products shipped from Tempe, AZ (from where 99% of our products are shipped from) consult the FedEx map below for the exact shipping time to your area. New, unopened merchandise returned with our prior approval will be credited to your account less a 10% restocking fee. The product must be returned to VASCA freight pre paid, and insured with a Return Authorization Number (RA#) clearly on the outside of the package. Please use the original invoice number as the RA#.